Isaias Afwerki Tigrinya: ኢሳይያስ ኣፈወርቂ? 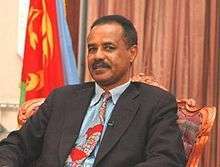 [isajas afwɐrkʼi]) (born February 2, 1946) is the first President of Eritrea, a position he has held since its independence in 1993. 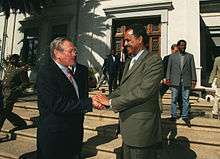 He led the Eritrean People's Liberation Front (EPLF) to victory in May 1991, thus ending the 30-year-old war for independence that the Eritrean people refer to as "Gedli". The EPLF adopted a new political party name, People's Front for Democracy and Justice (PFDJ) to reflect its new responsibilities. The PFDJ, with Isaias as its leader, remains the only governing party of Eritrea today. Isaias Afewerki was born in 1946 in Asmara, Eritrea, to parents Afwerki Abraha and Adanesh Berhe. He hails from the Biher-Tigrinya ethnic group. Isaias grew up in Asmara and graduated from Prince Makonnen High School in 1965. Scoring good grades in the General School Leaving Certificate Exams enabled him to secure admittance to the highly competitive College of Engineering at Haile Selassie I University (now called Addis Ababa University) in Addis Ababa, Ethiopia. However, a year later he interrupted his studies to join the Eritrean War of Independence. Isaias is married to Saba Haile and has two sons and one daughter. Eritrea's war for independence lasted from 1961 to 1991 and is referred to by the Eritrean people as "Gedli". Isaias became a part of the struggle in 1966, when he abandoned his engineering studies in Addis Ababa and left for Kassala, Sudan, joining the Eritrean Liberation Front (ELF) in exile. In early 1967, Isaias, along with Ramadan Mohammed Nour (later to be EPLF's Secretary General), was sent to China for military training. There they spent almost two years studying political ideologies and guerrilla warfare. Upon Isaias' return, he was appointed political commissar of the ELF. In 1969, ideological and tactical disagreements within the ELF led to three factions splitting from the ELF. One faction took refuge in the mountains of Sahel. Another group under command of Isaias, numbering less than a dozen, left for Eritrea's eastern escarpment. The third group headed off to Aden and returned by boat to Eritrea, landing south of Assab. These three groups would eventually join to become one under the name of the Eritrean Liberation Front-People's Liberation Front (ELF-PLF). When they formally merged in 1973, they changed their name to the Eritrean People's Liberation Front (EPLF). While a member of the EPLF leadership, Isaias Afewerki, Mesfin Hagos,Tewelde Eyob,Major General Asmerom Gerezgiher, and Solomon Weldemariam distinguished themselves by authoring an important EPLF manifesto in 1970 titled "Our Struggle and its Goals". This manifesto placed strong emphasis on overcoming ethnic and religious differences and on launching a revolutionary struggle in the independence war. In 1975, Isaias became chairman of the EPLF military committee. In 1977, under EPLF's first congress, he was elected vice secretary-general of the EPLF. He was elected secretary-general in 1987. By May 1991, the EPLF, under Isaias' leadership, was able to control all Eritrea and its units entered the capital city Asmara—thus crowning the 30 years of armed struggle for Liberation of the Eritrean people with victory. In essence, Eritrea became a de facto independent country on May 24, 1991. In April 1993, a United Nations-supervised referendum on independence was held, and the following month Eritrea achieved de jure independence. Isaias was declared the first head of state, a position he has held ever since the end of the war for independence. During the first few years of Isaias' administration, the institutions of governance were structured and put in place. This included the provision of an elected local judicial system, as well as an expansion of the educational system into as many regions as possible. The EPLF renamed itself the People's Front for Democracy and Justice (PFDJ) in February 1994 as part of its transition to a political party. In June 2015 a United Nations panel accused Afwerki of human rights abuses by stating that he "has imposed a reign of fear through systematic and extreme abuses of the population that may amount to crimes against humanity" Amnesty International believes that the government of President Isaias Afewerki has imprisoned at least 10,000 political prisoners. Amnesty also claims that torture — for punishment, interrogation and coercion — is widespread. In 2015 Reporters Without Borders ranked Eritrea under the government of President Isaias Afewerki last in its press-freedom index for the eighth year running. ↑ Eritrea - Minisitry of Information. "Eritrea at a glance". shabait.com. Eritrea - Minisitry of Information. Retrieved 26 September 2014. ↑ Eritrea - Ministry of Information. "President Isaias Afewerki's speech on the occasion of the 23rd Independence day celebrations". shabait.com. Eritrea - Ministry of Information. Retrieved 26 September 2014. 1 2 3 "Eritrea profile". BBC. Retrieved May 27, 2014. ↑ Africa Insight, Volumes 23-24. Africa Institute. 1993. p. 187. Retrieved 31 August 2016. ↑ "Perspective". VKP/KAM. Retrieved February 10, 2014. ↑ Dan Connell (1993). Against All Odds: A Chronicle of the Eritrean Revolution : with a New Foreword on the Postwar Transition. The Red Sea Press. ISBN 978-1-56902-046-3. Retrieved 20 April 2012. ↑ "Torture and Other Rights Abuses Are Widespread in Eritrea, U.N. Panel Says". New York Times. New York Times. 2015-06-08. Retrieved 2015-12-06. has imposed a reign of fear through systematic and extreme abuses of the population that may amount to crimes against humanity"
↑ "Eritrea: Rampant repression 20 years after independence", Amnesty International, London, 9 May 2013. Retrieved on 23 January 2015. ↑ "Eritrea - last in the World Press Freedom Index for the past eight years". Reporters Without Borders. Reporters Without Borders. 2015-06-12. Retrieved 2015-06-13. Eritrea has been ranked last in the Reporters Without Borders press freedom index for the past eight years.